Adherence to and promotion of the highest ethical standards in all occupations, including fair treatment of employers, employees, associates, competitors, and the public. 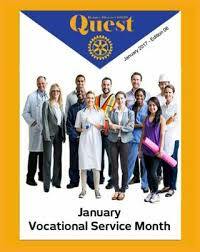 The recognition of the worthiness of all useful occupations, not just those that are pursued by Rotarians. The contribution of your vocational talents to solving the problems of society and meeting the needs of the community. Talk about your vocation in your club, and take time to learn about fellow members’ vocations. Use your professional skills to serve a community. Practice your profession with integrity, and inspire others to behave ethically through your own words and actions.